The Spectrum Analyzer System object™ displays the frequency spectrum of time-domain signals. This scope supports variable-size input, which allows the input frame size to change. Frame size is the first dimension of the input vector. The number of input channels must remain constant. Create the dsp.SpectrumAnalyzer object and set its properties. scope = dsp.SpectrumAnalyzer creates a Spectrum Analyzer System object. This object displays the frequency spectrum of real- and complex-valued floating- and fixed-point signals. scope = dsp.SpectrumAnalyzer(ports) creates a Spectrum Analyzer object and sets the NumInputPorts property to the value of ports. scope = dsp.SpectrumAnalyzer(Name,Value) sets properties using one or more name-value pairs. Enclose each property name in single quotes. Number of input ports, specified as a positive integer. Each signal coming through a separate input becomes a separate channel in the scope. You must invoke the scope with the same number of inputs as the value of this property. The domain of the input signal you want to visualize. If you visualize time-domain signals, the signal is transformed to the frequency spectrum based on the algorithm specified by the Method parameter. Open the Spectrum Settings. In the Main options section, set Input Domain. "Power" (default) | "Power density" | "RMS"
Specify the spectrum type to display. "Power density" — Power spectral density. The power spectral density is the magnitude squared of the spectrum normalized to a bandwidth of 1 hertz. "RMS" — Root mean square. The root-mean-square shows the square root of the sum of the squared means. This option is useful when viewing the frequency of voltage or current signals. Open the Spectrum Settings. In the Main options section, set Type. "Spectrum" (default) | "Spectrogram" | "Spectrum and spectrogram"
Specify the spectrum type as one of "Spectrum", "Spectrogram", or "Spectrum and spectrogram". "Spectrum" — shows the power spectrum. "Spectrogram" — shows frequency content over time. Each line of the spectrogram is one periodogram. Time scrolls from the bottom to the top of the display. The most recent spectrogram update is at the bottom of the display. "Spectrum and Spectrogram" — shows a dual view of a spectrum and spectrogram. Open the Spectrum Settings. In the Main options section, set View. Specify the sample rate, in hertz, of the input signals as a finite numeric scalar. Open the Spectrum Settings. In the Main options section, set Sample rate (Hz). "Welch" (default) | "Filter Bank"
Specify the spectrum estimation method as Welch or Filter bank. To enable this property, set InputDomain to "Time". Open the Spectrum Settings. In the Main options section, set Method. true — Compute and plot two-sided spectral estimates. When the input signal is complex-valued, you must set this property to true. false — Compute and plot one-sided spectral estimates. If you set this property to false, then the input signal must be real-valued. When this property is false, Spectrum Analyzer uses power-folding. The y-axis values are twice the amplitude that they would be if this property were set to true, except at 0 and the Nyquist frequency. A one-sided power spectral density (PSD) contains the total power of the signal in the frequency interval from DC to half of the Nyquist rate. For more information, see pwelch. Open the Spectrum Settings. In the Trace options section, select Two-sided spectrum. "Log" — displays the frequencies on the x-axis on a logarithmic scale. To use the "Log" setting, you must also set the PlotAsTwoSidedSpectrum property to false. "Linear" — displays the frequencies on the x-axis on a linear scale. To use the "Linear" setting, you must also set the PlotAsTwoSidedSpectrum property to true. Open the Spectrum Settings. In the Trace options section, set Scale. "Full" (default) | "Span and center frequency" | "Start and stop frequencies"
"Full" - The Spectrum Analyzer computes and plots the spectrum over the entire Nyquist frequency interval. "Span and center frequency" - The Spectrum Analyzer computes and plots the spectrum over the interval specified by the Span and CenterFrequency properties. "Start and stop frequencies" - The Spectrum Analyzer computes and plots the spectrum over the interval specified by the StartFrequency and StopFrequency properties. Open the Spectrum Settings. In the Main options section, select Full frequency span for "Full". Otherwise, clear the Full frequency span check box and choose between Span or FStart. Specify the frequency span, in hertz, over which the Spectrum Analyzer computes and plots the spectrum. The overall span, defined by this property and the CenterFrequency property, must fall within the Nyquist frequency interval. To enable this property, set FrequencySpan to "Span and center frequency". Open the Spectrum Settings. In the Main options section, clear the Full frequency span check box and set Span. Start of the frequency interval over which spectrum is computed, specified in hertz as a real scalar. The overall span, which is defined by this property and StopFrequency, must fall within the Nyquist frequency interval. To enable this property, set FrequencySpan to "Start and stop frequencies". Open the Spectrum Settings. In the Main options section, clear the Full frequency span and change Span to FStart. Set FStart (Hz). End of the frequency interval over which spectrum is computed, specified in hertz as a real scalar. The overall span, which is defined by this property and the StartFrequency property, must fall within the Nyquist frequency interval. Open the Spectrum Settings. In the Main options section, clear the Full frequency span and change Span to FStart. Set FStop (Hz). Specify in hertz the center frequency of the span over which the Spectrum Analyzer computes and plots the spectrum. The overall frequency span, defined by the Span and this property, must fall within the Nyquist frequency interval. Open the Spectrum Settings. In the Main, clear Full frequency span and set CF (Hz). 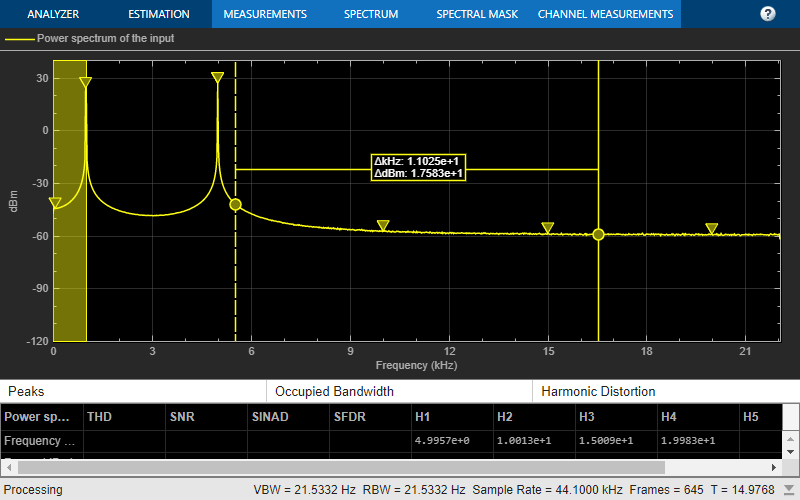 "RBW" (default) | "WindowLength" | "NumFrequencyBands"
Specify the frequency resolution method of the Spectrum Analyzer. "RBW" - the RBWSource and RBW properties control the frequency resolution (in Hz) of the analyzer. The FFT length is the window length that results from achieving the specified RBW value or 1024, whichever is larger. "WindowLength" - applies only when the Method property is set to "Welch". The WindowLength property controls the frequency resolution. You can control the number of FFT points only when the FrequencyResolutionMethod property is "WindowLength". "NumFrequencyBands" - applies only when the Method property is set to "Filter Bank". The FFTLengthSource and FFTLength properties control the frequency resolution. Open the Spectrum Settings. In the Main options section, set the frequency resolution method by selecting the RBW (Hz) dropdown. Specify the source of the resolution bandwidth (RBW) as either "Auto" or "Property". "Auto" — The Spectrum Analyzer adjusts the spectral estimation resolution to ensure that there are 1024 RBW intervals over the defined frequency span. "Property" — Specify the resolution bandwidth directly using the RBW property. InputDomain to "Time" and FrequencyResolutionMethod to "RBW". Open the Spectrum Settings. In the Main options section, set RBW (Hz). You can specify the overall span in different ways based on how you set the FrequencySpan property. Control the frequency resolution by specifying the window length, in samples used to compute the spectral estimates. The window length must be an integer scalar greater than 2. Open the Spectrum Settings. Change the RBW (Hz) dropdown to Window length. "Auto" - sets the FFT length to the window length specified in the WindowLength property or 1024, whichever is larger. "Property" - number of FFT points using the FFTLength property. FFTLength must be greater than WindowLength. To enable this property, set FrequencyResolutionMethod to "WindowLength". Open the Spectrum Settings. In the Main options section, next to the RBW (Hz) option, enter a number or select Auto. Specify the length of the FFT that the Spectrum Analyzer uses to compute spectral estimates. If FrequencyResolutionMethod is "RBW", the FFT length is set as the window length required to achieve the specified resolution bandwidth value or 1024, whichever is larger. FrequencyResolutionMethod is set to "WindowLength" or "NumFrequencyBands"
FFTLength is greater than or equal to the WindowLength. FFTLengthSource is set to "Property". Specify the number of filter taps or coefficients for each frequency band. This number must be a positive even integer. This value corresponds to the number of filter coefficients per polyphase branch. The total number of filter coefficients is equal to NumTapsPerBand + FFTLength. To enable this property, set Method to "Filter Bank"
Open the Spectrum Settings. In the Main options section, set Taps per band. "Auto" — The frequency vector is calculated from the length of the input. See Frequency Vector. "Property" — Enter a custom vector as the frequency vector. To enable this property, set InputDomain to "Frequency". Open the Spectrum Settings. In the Frequency input options section, set Frequency (Hz). Set the frequency vector that determines the x-axis of the display. The vector must be monotonically increasing and of the same size as the input frame size. To enable this property, set FrequencyVectorSource to "Property". The percentage overlap between the previous and current buffered data segments, specified as a real, scalar value. The overlap creates a window segment that is used to compute a spectral estimate. The value must be greater than or equal to zero and less than 100. Open the Spectrum Settings. In the Window options section, set Overlap (%). "Hann" (default) | "Rectangular" | "Chebyshev" | "Flat Top" | "Hamming" | "Kaiser" | "Blackman-Harris" | "Custom"
Specify a window function for the spectral estimator. The following table shows preset windows. For more information, follow the link to the corresponding function reference in the Signal Processing Toolbox™ documentation. To set your own spectral estimation window, set this property to "Custom" and specify a custom window function in the CustomWindow property. Open the Spectrum Settings. In the Window options section, set Window. Specify a custom window function as a character array or string. The custom window function name must be on the MATLAB path. This property is useful if you want to customize the window using additional properties available with the Signal Processing Toolbox version of the window function. Define and use a custom window function. To use this property, set Window to "Custom". Open the Spectrum Settings. In the Window options section, in the Window option box, enter a custom window function name. The window sidelobe attenuation, in decibels (dB). The value must be greater than or equal to 45. To enable this property, set Window to "Chebyshev" or "Kaiser". Open the Spectrum Settings. In the Window options section, set Attenuation (dB). "dBm" (default) | "dBV" | "dBW" | "Vrms" | "Watts"
Select the units of the frequency-domain input. This property allows the Spectrum Analyzer to scale frequency data if you choose a different display unit with the Units property. This option is only available when InputDomain is set to Frequency. Open the Spectrum Settings. In the Frequency input options section, set Input units. "Auto" (default) | "dBm" | "dBFS" | "dBV" | "dBW" | "Vrms" | "Watts"
Specify the units in which the Spectrum Analyzer displays power values. The available spectrum units depend on the value of SpectrumType. Time Power or Power density "dBFS", "dBm", "dBW", "Watts"
Open the Spectrum Settings. In the Trace options section, set Units. Specify the source of the dBFS scaling factor as either "Auto" or "Property". "Auto" - The Spectrum Analyzer adjusts the scaling factor based on the input data. "Property" - Specify the full-scale scaling factor using the FullScale property. To enable this property, set SpectrumUnits to "dBFS". Open the Spectrum Settings. In the Trace options section, set Full scale to Auto or enter a number. Specify a real positive scalar for the dBFS full scale. Running — Running average of the last n samples. Use the SpectralAverages property to specify n.
Exponential — Weighted average of samples. Use the ForgettingFactor property to specify the weighted forgetting factor. For more information about the averaging methods, see Averaging Method. To enable this property, set ViewType to "Spectrum" or "Spectrum and spectrogram". Open the Spectrum Settings. In the Trace options section, set Averaging method. The Spectrum Analyzer computes the current power spectrum estimate by computing a running average of the last N power spectrum estimates. This property defines N.
To enable this property, set ViewType to "Spectrum". This property applies only when the AveragingMethod is "Running". Open the Spectrum Settings. In the Trace options section, set Averages. Specify the exponential weighting as a scalar value greater than 0 and less than or equal to 1. This property applies only when the AveragingMethod is "Exponential". Open the Spectrum Settings. In the Trace options section, set Forgetting factor. The load the scope uses as a reference to compute power levels. Open the Spectrum Settings. In the Trace options section, set Reference load. Scalar — Apply the same frequency offset to all channels, specified in hertz as a character vector. Vector — apply a specific frequency offset for each channel, specify a vector of frequencies. The vector length must be equal to number of input channels. The frequency-axis values are offset by the values specified in this property. The overall span must fall within the Nyquist frequency interval. You can control the overall span in different ways based on how you set the FrequencySpan property. Open the Spectrum Settings. In the Trace options section, set Offset (Hz). Specify the channel for which the spectrogram is plotted, as a real, positive scalar integer in the range [1 N], where N is the number of input channels. To enable this property, set ViewType to "Spectrogram" or "Spectrum and spectrogram". Open the Spectrum Settings. In the Spectrogram options section, select a Channel. Specify the source for the time resolution of each spectrogram line as either "Auto" or "Property". The TimeResolution property shows the time resolution for the different frequency resolution methods and time resolution properties. Open the Spectrum Settings. In the Spectrogram options section, set Time res (s). Specify the time resolution of each spectrogram line as a positive scalar, expressed in seconds. The time resolution value is determined based on frequency resolution method, the RBW setting, and the time resolution setting. Welch or Filter Bank RBW (Hz) Manually entered Manually entered Must be equal to or greater than the minimum attainable time resolution, 1/RBW. Several spectral estimates are combined into one spectrogram line to obtain the desired time resolution. Interpolation is used to obtain time resolution values that are not integer multiples of 1/RBW. Welch Window length — Manually entered Must be equal to or greater than the minimum attainable time resolution. Several spectral estimates are combined into one spectrogram line to obtain the desired time resolution. Interpolation is used to obtain time resolution values that are not integer multiples of 1/RBW. Filter Bank Number of frequency bands — Manually entered Must be equal to or greater than the minimum attainable time resolution, 1/RBW. ViewType to "Spectrogram" or "Spectrum and spectrogram"
Open the Spectrum Settings. In the Spectrogram options section, in the Time res (s) box, enter a number. Specify the source for the time span of the spectrogram as either "Auto" or "Property". If you set this property to "Auto", the spectrogram displays 100 spectrogram lines at any given time. If you set this property to "Property", the spectrogram uses the time duration you specify in seconds in the TimeSpan property. Open the Spectrum Settings. In the Spectrogram options section, set Time span (s). Specify the time span of the spectrogram display in seconds. You must set the time span to be at least twice as large as the duration of the number of samples required for a spectral update. ViewType to "Spectrogram" or "Spectrum and spectrogram". Open the Spectrum Settings. In the Spectrogram options section, in the Time span (s) box, enter a number. Channel for which the measurements are obtained, specified as a real, positive integer greater than 0 and less than or equal to 100. The maximum number you can specify is the number of channels (columns) in the input signal. Click on Tools > Measurements and open the Trace Selection settings. EnabledMasks — Masks to enable, specified as a character vector or string. Valid values are "None", "Upper", "Lower", or "Upper and lower". UpperMask — Upper limit spectral mask, specified as a scalar or two-column matrix. If UpperMask is a scalar, the upper limit mask uses the power value of the scalar for all frequency values applicable to the Spectrum Analyzer. If UpperMask is a matrix, the first column contains the frequency values (Hz), which correspond to the x-axis values. The second column contains the power values, which correspond to the associated y-axis values. To apply offsets to the power and frequency values, use the ReferenceLevel and MaskFrequencyOffset property values, respectively. LowerMask — Lower limit spectral mask, specified as a scalar or two-column matrix. If LowerMask is a scalar, the lower limit mask uses the power value of the scalar for all frequency values applicable to the Spectrum Analyzer. If LowerMask is a matrix, the first column contains the frequency values (Hz), which correspond to the x-axis values. The second column contains the power values, which correspond to the associated y-axis values. To apply offsets to the power and frequency values, use the ReferenceLevel and MaskFrequencyOffset property values, respectively. ReferenceLevel — Reference level for mask power values, specified as either "Custom" or "Spectrum peak". When ReferenceLevel is "Custom", the CustomReferenceLevel property value is used as the reference to the power values, in dBr, in the UpperMask and LowerMask properties. When ReferenceLevel is "Spectrum peak", the peak value of the current spectrum of the SelectedChannel is used. CustomReferenceLevel — Custom reference level, specified as a real value, in the same units as the power units. The reference level is the value to which the power values in the UpperMask and LowerMask properties are referenced. This property applies when ReferenceLevel is set to "Custom". This property uses the same units as the PowerUnits property of the Spectrum Analyzer. SelectedChannel — Input channel with peak spectrum to use as the mask reference level, specified as an integer. This property applies when ReferenceLevel is set to "Spectrum peak". MaskFrequencyOffset — Frequency offset, specified as a finite, numeric scalar. Frequency offset is the amount of offset to apply to frequency values in the UpperMask and LowerMask properties. All SpectralMaskSpecification properties are tunable. Masks are overlaid on the spectrum. If the mask is green, the signal is passing the mask limitations. If the mask is red, the signal is failing the mask limits. To modify the spectral mask and see the spectral mask status, in the scope toolbar, select the spectral mask button, . In the Spectral Mask pane that opens, you can modify the masks and see details about what percentage of the time the mask is succeeding, which mask is failing, how many times the mask failed, and which channels are causing the failure. To get the current status of the spectral masks, call the function getSpectralMaskStatus. To perform an action every time the mask fails, use the MaskTestFailed event. To trigger a function when the mask fails, create a listener to the MaskTestFailed event and define a callback function to trigger. For more details about using events, see Events (MATLAB). Open the Spectral Mask pane and modify the Settings options. Enable peak finder to compute and display the largest calculated peak values. The PeakFinder property uses the PeakFinderSpecification properties. MinHeight –– Level above which peaks are detected, specified as a scalar value. NumPeaks –– Maximum number of peaks to show, specified as a positive integer scalar less than 100. MinDistance –– Minimum number of samples between adjacent peaks, specified as a positive real scalar. Threshold –– Minimum height difference between peak and its neighboring samples, specified as a nonnegative real scalar. LabelFormat –– Coordinates to display next to the calculated peak value, specified as a character vector or a string scalar. Valid values are "X", "Y", or "X + Y". Enable –– Set this property to true to enable peak finder measurements. Valid values are true or false. All PeakFinderSpecification properties are tunable. Open the Peak Finder pane ( ) and modify the Settings options. Enable cursor measurements to display screen or waveform cursors. The CursorMeasurements property uses the CursorMeasurementsSpecification properties. Type –– Type of the display cursors, specified as either "Screen cursors" or "Waveform cursors". ShowHorizontal –– Set this property to true to show the horizontal screen cursors. This property applies when you set the Type property to "Screen cursors". ShowVertical –– Set this property to true to show the vertical screen cursors. This property applies when you set the Type property to "Screen cursors". Cursor1TraceSource –– Specify the waveform cursor 1 source as a positive real scalar. This property applies when you set the Type property to "Waveform cursors". Cursor2TraceSource –– Specify the waveform cursor 2 source as a positive real scalar. This property applies when you set the Type property to "Waveform cursors". LockSpacing –– Lock spacing between cursors, specified as a logical scalar. SnapToData –– Snap cursors to data, specified as a logical scalar. XLocation –– x-coordinates of the cursors, specified as a real vector of length equal to 2. YLocation –– y-coordinates of the cursors, specified as a real vector of length equal to 2. This property applies when you set the Type property to "Screen cursors". Enable –– Set this property to true to enable cursor measurements. Valid values are true or false. All CursorMeasurementsSpecification properties are tunable. Open the Cursor Measurements pane ( ) and modify the Settings options. Enable channel measurements to compute and display the occupied bandwidth or adjacent channel power ratio. The ChannelMeasurements property uses the ChannelMeasurementsSpecification properties. Algorithm –– Type of measurement data to display, specified as either "Occupied BW" or "ACPR". FrequencySpan –– Frequency span mode, specified as either "Span and center frequency" or "Start and stop frequencies"
Default: "Span and center frequency"
Span –– Frequency span over which the channel measurements are computed, specified as a real, positive scalar in Hz. This property applies when you set the FrequencySpan property to "Span and center frequency". CenterFrequency –– Center frequency of the span over which the channel measurements are computed, specified as a real scalar in Hz. This property applies when you set the FrequencySpan property to "Span and center frequency". StartFrequency –– Start frequency over which the channel measurements are computed, specified as a real scalar in Hz. This property applies when you set the FrequencySpan property to "Start and stop frequencies". StopFrequency –– Stop frequency over which the channel measurements are computed, specified as a real scalar in Hz. This property applies when you set the FrequencySpan property to "Start and stop frequencies". PercentOccupiedBW –– Percent of power over which to compute the occupied bandwidth, specified as a positive real scalar. This property applies when you set the Algorithm property to "Occupied BW". NumOffsets –– Number of adjacent channel pairs, specified as a real, positive integer. This property applies when you set the Algorithm property to "ACPR". AdjacentBW –– Adjacent channel bandwidth, specified as a real, positive scalar. This property applies when you set the Algorithm property to "ACPR". FilterShape –– Filter shape for both main and adjacent channels, specified as "None", "Gaussian", or "RRC". This property applies when you set the Algorithm property to "ACPR". FilterCoeff –– Channel filter coefficient, specified as a real scalar between 0 and 1. This property applies when you set the Algorithm property to "ACPR" and the FilterShape property to either "Gaussian" or "RRC". ACPROffsets –– Frequency of the adjacent channel relative to the center frequency of the main channel, specified as a real vector of length equal to the number of offset pairs specified in NumOffsets. This property applies when you set the Algorithm property to "ACPR". Enable –– Set this property to true to enable channel measurements. Valid values are true or false. All ChannelMeasurementsSpecification properties are tunable. Open the Channel Measurements pane ( ) and modify the Measurement and Channel Settings options. Enable distortion measurements to compute and display the harmonic distortion and intermodulation distortion. The DistortionMeasurements property uses the DistortionMeasurementsSpecification properties. Algorithm –– Type of measurement data to display, specified as either "Harmonic" or "Intermodulation". NumHarmonics –– Number of harmonics to measure, specified as a real, positive integer. This property applies when you set the Algorithm to "Harmonic". Enable –– Set this property to true to enable distortion measurements. All DistortionMeasurementsSpecification properties are tunable. 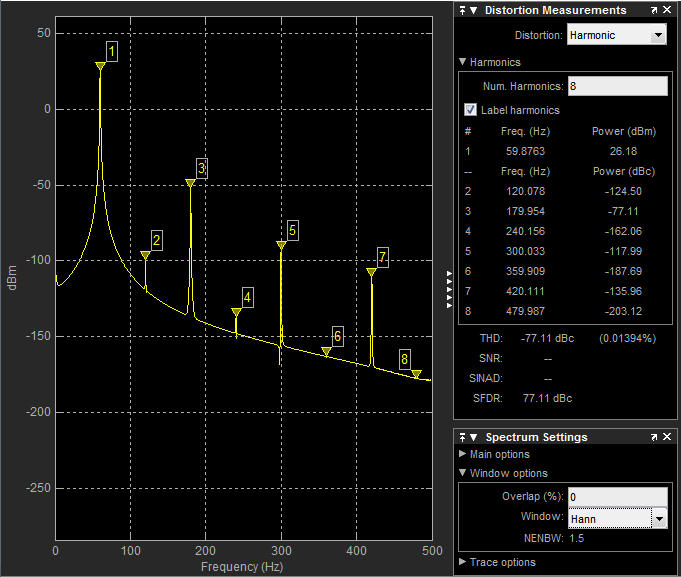 Open the Distortion Measurements pane ( ) and modify the Distortion and Harmonics options. Enable CCDF measurements to display the probability of the input signal's instantaneous power being a certain amount of dB above the signal's average power. The CCDFMeasurements property uses the CCDFMeasurementsSpecification properties. PlotGaussianReference –– Show a reference CCDF curve of additive white Gaussian noise. Set this property to true to plot a reference CCDF curve. Enable –– Set this property to true to enable CCDF measurements. Valid values are true or false. All CCDFMeasurementsSpecification properties are tunable. Open the CCDF Measurements pane ( ) and enable the Plot Gaussian reference option. Title of the scope window. Spectrum Analyzer window position in pixels, specified by the size and location of the scope window as a four-element double vector of the form [left bottom width height]. You can place the scope window in a specific position on your screen by modifying the values to this property. By default, the window appears in the center of your screen with a width of 800 pixels and height of 450 pixels. The exact center coordinates depend on your screen resolution. Specify the type of plot to use for displaying normal traces as either "Line" or "Stem". Normal traces are traces that display free-running spectral estimates. ViewType to "Spectrum" or "Spectrum and spectrogram"
Open the Style properties and set Plot type. Set this property to false to remove the display of the normal traces. These traces display the free-running spectral estimates. 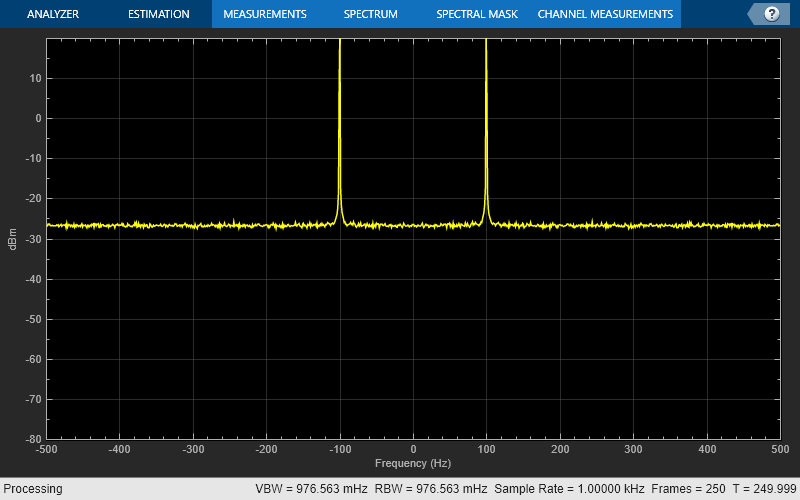 Even when the traces are removed from the display, the Spectrum Analyzer continues its spectral computations. Open the Spectrum Settings. In the Trace options section, select Normal trace. To compute and plot the maximum-hold spectrum of each input channel, set this property to true. The maximum-hold spectrum at each frequency bin is computed by keeping the maximum value of all the power spectrum estimates. When you toggle this property, the Spectrum Analyzer resets its maximum-hold computations. Open the Spectrum Settings. In the Trace options section, select Max-hold trace. To compute and plot the minimum-hold spectrum of each input channel, set this property to true. The minimum-hold spectrum at each frequency bin is computed by keeping the minimum value of all the power spectrum estimates. When you toggle this property, the Spectrum Analyzer resets its minimum-hold computations. Open the Spectrum Settings. In the Trace options section, select Min-hold trace. The simulation speed is faster when this property is set to true. true — the scope logs data for later use and updates the display at fixed intervals of time. Data occurring between these fixed intervals might not be plotted. false — the scope updates every time it computes the power spectrum. Use the false setting when you do not want to miss any spectral updates at the expense of slower simulation speed. Select Playback > Reduce plot rate to improve performance. Specify the display title as a character vector or string. Open the Configuration Properties. Set Title. Specify the text for the scope to display to the left of the y-axis. Regardless of this property, Spectrum Analyzer always displays power units as one of the SpectrumUnits values. Open the Configuration Properties. Set Y-label. To show a legend with the input names, set this property to true. From the legend, you can control which signals are visible. This control is equivalent to changing the visibility in the Style dialog box. In the scope legend, click a signal name to hide the signal in the scope. To show the signal, click the signal name again. To show only one signal, right-click the signal name. To show all signals, press Esc. The legend only shows the first 20 signals. Any additional signals cannot be viewed or controlled from the legend. Open the Configuration Properties. On the Display tab, select Show legend. Specify the input channel names as a cell array of character vectors. The names appear in the legend, Style dialog box, and Measurements panels. If you do not specify names, the channels are labeled as Channel 1, Channel 2, etc. To see channel names, set ShowLegend to true. On the legend, double-click the channel name. Set this property to true to show gridlines on the plot. Open the Configuration Properties. On the Display tab, set Show grid. Specify the y-axis limits as a two-element numeric vector, [ymin ymax]. To enable this property, set the ViewType property to "Spectrum" or "Spectrum and spectrogram". The units directly depend upon the SpectrumUnits property. Open the Configuration Properties. Set Y-limits (maximum) and Y-limits (minimum). Control the color limits of the spectrogram using a two-element numeric vector, [colorMin colorMax]. To enable this property, set the ViewType property to "Spectrogram" or "Spectrum and spectrogram". Open the Configuration Properties. Set Color-limits (minimum) and Color-limits (maximum). "Auto" (default) | "Manual" | "OnceAtStop" | "Updates"
"Auto" — The scope scales the axes as-needed to fit the data, both during and after simulation. "Manual" — The scope does not scale the axes automatically. "OnceAtStop" — The scope scales the axes when the simulation stops. "Updates" — The scope scales the axes once after 10 updates. Select Tools > Axes Scaling. Specify the layout type as "Horizontal" or "Vertical". A vertical layout stacks the spectrum above the spectrogram. A horizontal layout puts the two views side-by-side. To enable this property, set ViewType to "Spectrum and spectrogram". Open the Spectrum Settings. Set Axes layout. scope(signal) updates the spectrum of the signal in the spectrum analyzer. scope(signal1,signal2,...,signalN) displays multiple signals in the spectrum analyzer. The signals must have the same frame length, but can vary in number of channels. You must set the NumInputPorts property to enable multiple input signals. 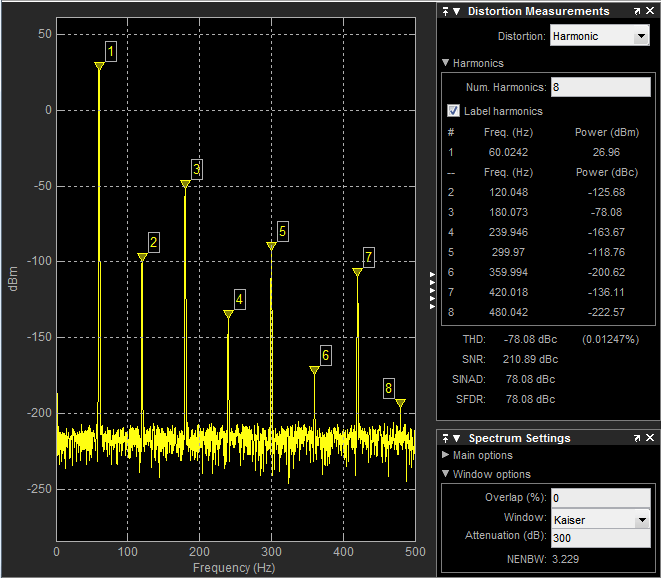 Specify one or more input signals to visualize in the dsp.SpectrumAnalyzer. Signals can have a different number of channels, but must have the same frame length. View a one-sided power spectrum made from the sum of fixed real sine waves with different amplitudes and frequencies. Run the release method to let property values and input characteristics change. The scope automatically scales the axes. 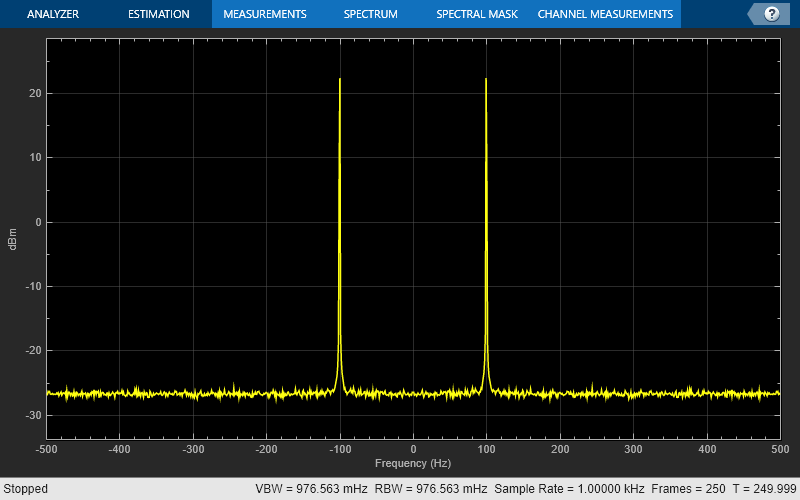 Run the clear function to close the Spectrum Analyzer window. This example shows the spectrogram for a chirp signal with added random noise. View a two-sided power spectrum of a sine wave with noise on the Spectrum Analyzer. Run the release method to change property values and input characteristics. The scope automatically scales the axes. It updates the display one more time if any data is in the internal buffer. Run the MATLAB clear function to close the Spectrum Analyzer window. Use the Spectrum Analyzer to display frequency input from spectral estimates of sinusoids embedded in white Gaussian noise. Initialize two dsp.SpectrumEstimator objects to display. Set one object to use the Welch-based spectral estimation technique with a Hann window, set the other object use a filter bank estimation. Specify a noisy sine wave input signal with four sinusoids at 0.16, 0.2, 0.205, and 0.25 cycles/sample. 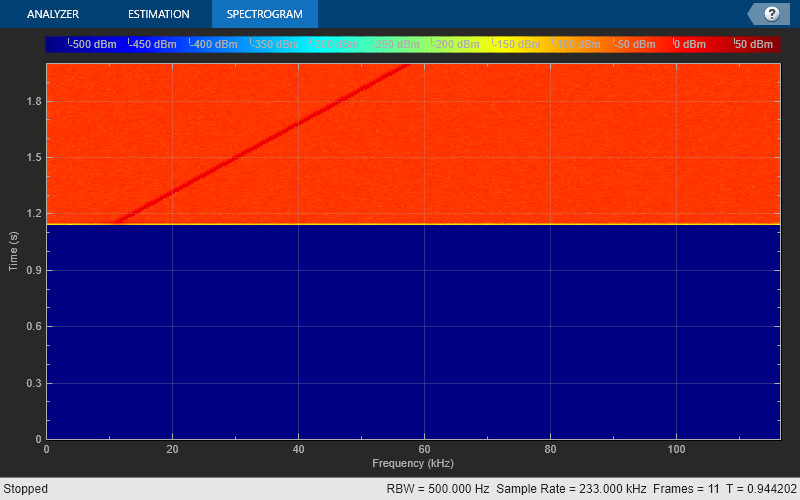 View the spectral estimate using a third object, a spectrum analyzer, set to process frequency input. Stream the input. 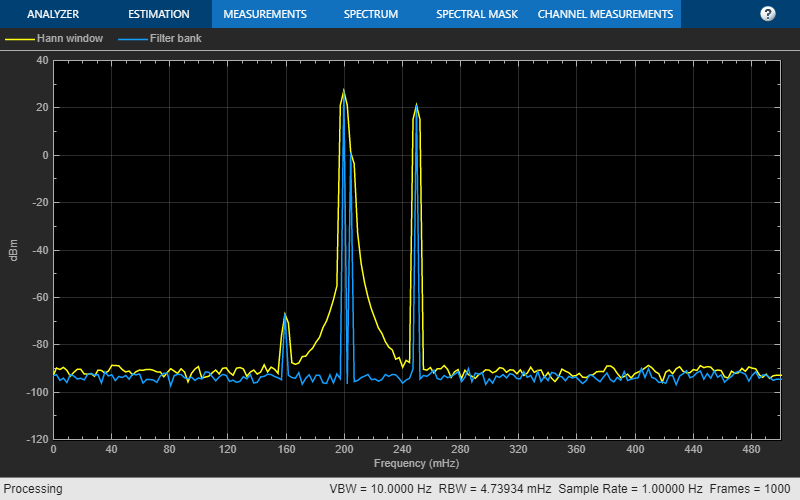 Compare the spectral estimates in the spectrum analyzer. The input sine wave has two frequencies: 1000 Hz and 5000 Hz. Create two dsp.SineWave System objects to generate these two frequencies. Create a dsp.SpectrumAnalyzer System object to compute and display the power spectrum. To obtain the measurements, set the Enable property of the measurements to true. Stream in the noisy sine wave input signal and estimate the power spectrum of the signal using the spectrum analyzer. Measure the characteristics of the spectrum. Use the getMeasurementsData function to obtain these measurements programmatically. The isNewDataReady function indicates when there is new spectrum data. The measured data is stored in the variable data. The right side of the spectrum analyzer shows the enabled measurement panes. The values shown in these panes match with the values shown in the last time step of the data variable. You can access the individual fields of data to obtain the various measurements programmatically. Peak values are obtained by the PeakFinder property. Verify that the peak values obtained in the last time step of data match the values shown on the spectrum analyzer plot. To close the scope window and clear its associated data, use the MATLAB® clear function. To hide or show the scope window, use the hide and show functions. Use the MATLAB mcc function to compile code containing a Spectrum Analyzer. You cannot open Spectrum Analyzer configuration dialog boxes if you have more than one compiled component in your application. When you set the Method property to Welch, the following algorithms apply. The Spectrum Analyzer uses the RBW or the Window Length setting in the Spectrum Settings pane to determine the data window length. Then, it partitions the input signal into a number of windowed data segments. 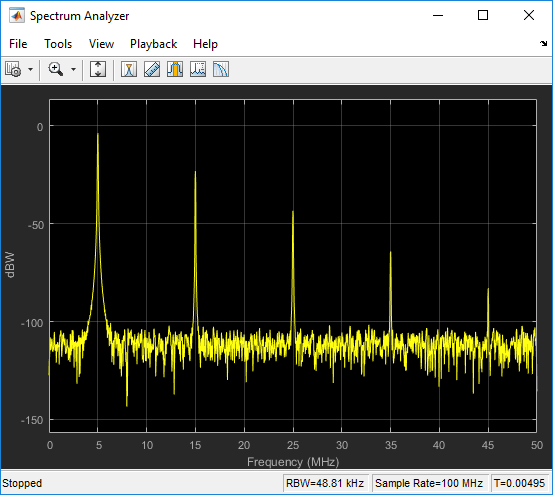 Finally, Spectrum Analyzer uses the modified periodogram method to compute spectral updates, averaging the windowed periodograms for each segment. Spectrum Analyzer requires that a minimum number of samples to compute a spectral estimate. This number of input samples required to compute one spectral update is shown as Samples/update in the Main options pane. This value is directly related to resolution bandwidth, RBW, by the following equation, or to the window length, by the equation shown in step 2. The normalized effective noise bandwidth, NENBW, is a factor that depends on the windowing method. Spectrum Analyzer shows the value of NENBW in the Window Options pane of the Spectrum Settings pane. Overlap percentage, Op, is the value of the Overlap % parameter in the Window Options pane of the Spectrum Settings pane. Fs is the sample rate of the input signal. Spectrum Analyzer shows sample rate in the Main Options pane of the Spectrum Settings pane. When in Window Length mode, the window length is used as specified. The number of input samples required to compute one spectral update, Nsamples, is directly related to the window length and the amount of overlap by the following equation. When you increase the overlap percentage, fewer new input samples are needed to compute a new spectral update. For example, if the window length is 100, then the number of input samples required to compute one spectral update is given as shown in the following table. The normalized effective noise bandwidth, NENBW, is a window parameter determined by the window length, Nwindow, and the type of window used. If w(n) denotes the vector of Nwindow window coefficients, then NENBW is given by the following equation. 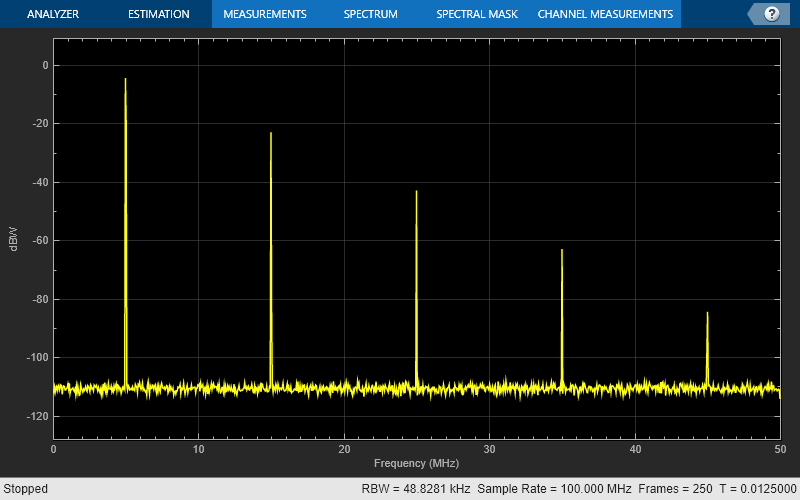 Spectrum Analyzer removes this message and displays a spectral estimate when enough data has been input. The number of FFT points (Nfft) is independent of the window length (Nwindow). You can set them to different values if Nfft is greater than or equal to Nwindow. When you set the Method property to Filter Bank, the following algorithms apply. The Spectrum Analyzer uses the RBW (Hz) or the Number of frequency band property in the Spectrum Settings pane to determine the input frame length. Spectrum Analyzer requires a minimum number of samples to compute a spectral estimate. This number of input samples required to compute one spectral update is shown as Samples/update in the Main options pane. This value is directly related to resolution bandwidth, RBW, by the following equation. Fs is the sample rate of the input signal. Spectrum Analyzer shows sample rate in the Main Options pane of the Spectrum Settings pane. For more information about the filter bank algorithm, see Polyphase Implementation. When the PlotAsTwoSidedSpectrum property is set to true, the interval is [−SampleRate2,SampleRate2]+FrequencyOffset hertz. When the PlotAsTwoSidedSpectrum property is set to false, the interval is [0,SampleRate2]+FrequencyOffset hertz. Spectrum Analyzer calculates and plots the power spectrum, power spectrum density, and RMS computed by the modified Periodogram estimator. For more information about the Periodogram method, see periodogram. Power Spectral Density — The power spectral density (PSD) is given by the following equation. In this equation, x[n] is the discrete input signal. On every input signal frame, Spectrum Analyzer generates as many overlapping windows as possible, with each window denoted as x(p)[n], and computes their periodograms. Spectrum Analyzer displays a running average of the P most current periodograms. Power Spectrum — The power spectrum is the product of the power spectral density and the resolution bandwidth, as given by the following equation. Spectrogram — You can plot any power as a spectrogram. Each line of the spectrogram is one periodogram. The time resolution of each line is 1/RBW, which is the minimum attainable resolution. Achieving the resolution you want may require combining several periodograms. You then use interpolation to calculate noninteger values of 1/RBW. In the spectrogram display, time scrolls from top to bottom, so the most recent data is shown at the top of the display. The offset shows the time value at which the center of the most current spectrogram line occurred. When set to Auto, the frequency vector for frequency-domain input is calculated by the software. The Occupied BW is calculated as follows. Calculate the total power in the measured frequency range. The bandwidth between the lower and upper power frequency values is the occupied bandwidth. The frequency halfway between the lower and upper frequency values is the center frequency. The Distortion Measurements are computed as follows. Spectral content is estimated by finding peaks in the spectrum. When the algorithm detects a peak, it records the width of the peak and clears all monotonically decreasing values. That is, the algorithm treats all these values as if they belong to the peak. Using this method, all spectral content centered at DC (0 Hz) is removed from the spectrum and the amount of bandwidth cleared (W0) is recorded. The fundamental power (P1) is determined from the remaining maximum value of the displayed spectrum. A local estimate (Fe1) of the fundamental frequency is made by computing the central moment of the power near the peak. The bandwidth of the fundamental power content (W1) is recorded. Then, the power from the fundamental is removed as in step 1. The power and width of the higher-order harmonics (P2, W2, P3, W3, etc.) are determined in succession by examining the frequencies closest to the appropriate multiple of the local estimate (Fe1). Any spectral content that decreases monotonically about the harmonic frequency is removed from the spectrum first before proceeding to the next harmonic. Once the DC, fundamental, and harmonic content is removed from the spectrum, the power of the remaining spectrum is examined for its sum (Premaining), peak value (Pmaxspur), and median value (Pestnoise). The sum of all the removed bandwidth is computed as Wsum = W0 + W1 + W2 +...+ Wn. The sum of powers of the second and higher-order harmonics are computed as Pharmonic = P2 + P3 + P4 +...+ Pn. Where dF is the absolute difference between frequency bins, and RBW is the resolution bandwidth of the window. The metrics for SNR, THD, SINAD, and SFDR are then computed from the estimates. The harmonic distortion measurements use the spectrum trace shown in the display as the input to the measurements. The default Hann window setting of the Spectrum Analyzer may exhibit leakage that can completely mask the noise floor of the measured signal. The harmonic measurements attempt to correct for leakage by ignoring all frequency content that decreases monotonically away from the maximum of harmonic peaks. If the window leakage covers more than 70% of the frequency bandwidth in your spectrum, you may see a blank reading (–) reported for SNR and SINAD. If your application can tolerate the increased equivalent noise bandwidth (ENBW), consider using a Kaiser window with a high attenuation (up to 330 dB) to minimize spectral leakage. The DC component is ignored. After windowing, the width of each harmonic component masks the noise power in the neighborhood of the fundamental frequency and harmonics. To estimate the noise power in each region, Spectrum Analyzer computes the median noise level in the nonharmonic areas of the spectrum. It then extrapolates that value into each region. where F1 and F2 are the sinusoid input frequencies and |A| + |B| = N. A and B are integer values. Running — For each frame of input, average the last N scaled Z vectors that are computed by the algorithm. The variable N is the value you specify for the number of spectral averages. If the algorithm does not have enough Z vectors, the algorithm uses zeros to fill the empty elements. Exponential — The moving average using the exponential weighting method is computed over the current Z vector and the previous Z vector. For details on the computation, see Exponential Weighting Method in the dsp.MovingAverage object. Supports MEX code generation by treating the calls to the object as extrinsic. Does not support code generation for standalone applications.